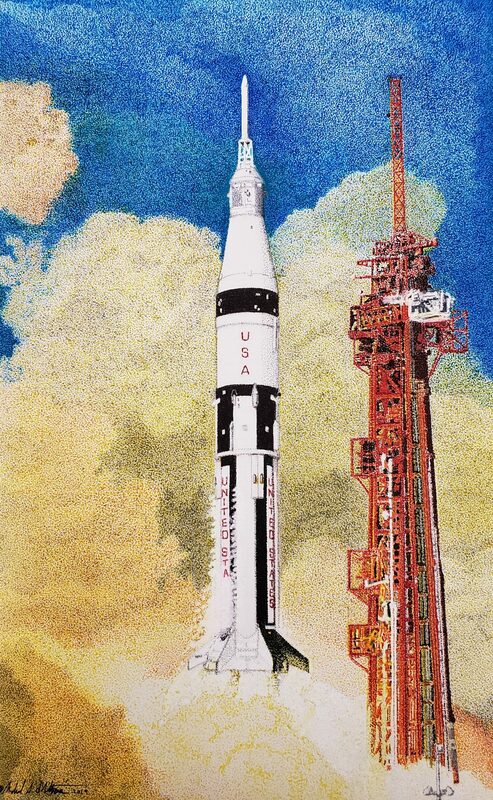 This piece was produced with the assistance of Astronaut Colonel Walter Cunningham who provided numerous photographs of the Apollo 7 mission Saturn 1B and Command/Service Module. To both Walt and myself, Apollo 7 was critical to Apollo landing man on the moon before the end of the decade. Being the first manned mission after the Apollo 1 tragedy, everything depended on its success. This was the impetus of the pointillism piece. To quote Walter Cunningham: “It was the most successful test flight–ever. It was also the first of five giant steps to land a man on the moon”. Many thanks, sir, for your valuable inputs and comments. Created using watercolor and acrylic ink pens on 10″ x 16″ illustration board. This artwork is copyright © Michael d'Albertis. All rights reserved.